Your family's comfort is our number one concern. From Heating & Air Conditioning to Plumbing & Maintenance, we take care of it all. G&G Plumbing and Heating specializes in the residential and commercial areas of the building industry. Hot Water Tech, a division of Crown Plumbing & Heating, are Central Alberta’s Hot Water Experts on Floor Heating, Tankless Water Heaters & Furnaces, with Same Day Service on Tank Replacements. Brad's Plumbing & Heating services Red Deer and the surrounding areas. 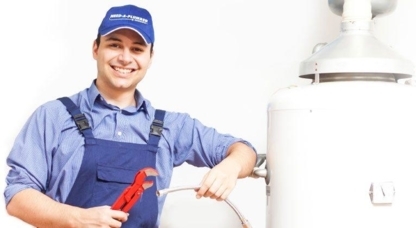 Brad's Plumbing & Heating specializes in repair, replacement and maintenance with fast, friendly & efficient service. Call Today! In our Business a Flush is Better then a Full House! B.W Bouwman Plumbing offers plumbing, heating and mechanical services as well as repairs & new installations for construction and residential projects. Call us today for a quote! Commercial, Residential & Agricultural Plumbing & Heating Service. Serving Red Deer & Central Alberta. Call us Today! Quality Workmanship. Call for Free Estimates! 24 HOUR EMERGENCY SERVICE!! ALL PAYMENT METHODS ACCEPTED! We are your locally owned plumber with 38 years experience in Red Deer and surrounding rural communities! Residential, Commercial & Industrial cleaning, maintenance, repair. Give us a call! Plumbing & Heating for Residential, Commercial and Industrial! Aspenworks Mechanical is here to help you with all of your plumbingneeds. Serving Rimbey, Red Deer, Bluffton, Bentley, Rocky Mountain House, and surrounding areas. Contact us today! Conseils pratiques pour choisir le bon plombier à Red Deer AB. Dans le choix d’un entrepreneur en plomberie résidentielle à Red Deer AB, il est important de rechercher efficacité, expérience et fiabilité. Les entrepreneurs en plomberie de votre région peuvent tout aussi bien installer la plomberie de votre nouvelle maison, réparer une fuite majeure ou remplacer une tuyauterie endommagée ou obsolète. Bonne réputation : Engagez un entrepreneur en plomberie à Red Deer AB qui est qualifié, expérimenté, reconnu pour son bon travail constant et recommandé par une source sûre. Trouvez un plombier à Red Deer AB qui se spécialise dans la tâche à effectuer, puis choisissez celui qui vous convient.